(PhysOrg.com) -- Extremely hydrophobic materials cause water to roll right off objects that have been coated with them. Up to now, it was assumed that aircraft or wind turbines coated in such a way did not ice up as easily. However, researchers from ETH Zurich have now shown that, under certain conditions, the surface materials do not influence ice formation. Since the onset of winter in the Swiss Alps, we have seen some impressive images: iced-up cables on cable cars, which have to be de-iced in breathtaking operations at dizzying heights; and snowed-in weather stations, the measuring equipment and rails of which are covered in bizarre ice sculptures. Such mighty ice crystallisations can also form on aircraft and compromise air safety. 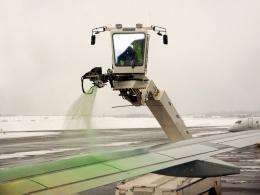 The surfaces of aircraft or even wind turbines can thus be given special, usually rough coatings that are extremely water-resistant (superhydrophobic) and therefore should also counteract ice formation. Lotus flower principle against ice formation? Such a coating often consists of tiny particles that, on the one hand, form a layer with a roughness corresponding to the particle size and, on the other hand, already have a rough surface themselves. In other words, superhydrophobic coatings often feature more than one roughness sizes. Air cushions form in the tiny pits of these rough surfaces, meaning that the water droplet has a minimal surface contact. The water droplet so-called contact angle to the underlying surface is thus as large as possible and causes water droplets to simply roll off. The principle works in a similar way to lotus flower leaves. Ice crystals do not necessarily form at the temperature of zero degree Celsius. Under certain conditions pure distilled water can remain liquid up to temperatures as low as minus forty degrees. Surfaces can influence the formation of crystallisation nuclei, which then form underneath on the contact surface and permeate the entire water droplet very rapidly. Consequently, up to now it was assumed that a superhydrophobic surface, which only touches a water drop minimally, delays ice formation for as long as possible or even prevents it. Three years ago, researchers from ETH Zurich were asked by the European Aeronautic Defence and Space Company (EADS) to investigate the issue more closely. For their study, the team of scientists headed by Dimos Poulikakos, professor of Thermodynamics in the the Institute of Energy Technology at ETH Zurich, studied supercooled water droplets on four different kinds of surfaces with various hydrophobic properties. They exposed the test set-up to an environment with an atmospheric humidity form 30 to 100 percent and a constant temperature of minus fifteen degrees Celsius. The classical heterogeneous freezing of the supercooled liquid was indeed observed without an airstream; in other words, the droplet contact with the surface initiated ice nucleation, and a porous ice skeleton that still contained water pockets was rapidly generated (within thirty milliseconds). These water pockets remain intact for a short time as heat is also released during the formation of ice. In a second phase, which at twenty seconds takes almost a thousand times longer than the skeleton formation phase, the water droplet ultimately freezes completely. However, when the researchers conducted the experiment with a stream of air flowing through the test set-up at a constant temperature of minus fifteen degrees, the ice-formation process was completely different: despite the contact of the water drop with the surface, the first phase of the freezing process starts from the free surface of the water droplet and is already complete within eighteen milliseconds. The slower second phase follows, during which the skeleton freezes completely from the bottom. The researchers conclude that environmental influences can drastically affect the formation of ice on superhydrophobic materials. However, if the humidity in the experiment is increased to a point where almost no more evaporation can take place, the heterogeneous nucleation of the ice crystals takes place again. The industry needs to be aware of these results, which stem directly from basic thermodynamics research and have now been published in Nature Communications, says Poulikakos. However, hydrophobic surfaces remain important as they allow water to run off. If possible, Poulikakos suggests, one could try to construct superhydrophobic surfaces that are not as rough. This is easier said than done, however, as there would then be fewer of the air pockets needed for a superhydrophobic surface. The purpose of chemtrails was to introduce bizarre substances into the air for weather control. But once there, they precipitate out. The unnatural materials are why, among other things, fground water out of faucets doesn't always rotate counterclockwise going down a drain the way it used to. Localized die offs of plants is due to localized build ups of this poison affecting parets of plants through their rots but not others. This material is mechanically different from water. The "snow" storm near Halloween in New Jersey had trees breaking with the weight. New World Order shills said it was the weight of snow and leaves. Leaves don't weigh that much, and trees can stand leaves, heavy winds and deluge rain! The "snow" was abnormally dense. And what's coating hydrophobic materials is not ice but a frozen form of these unnatural chemicals. This has nothing to do with chemtrails, moron. Besides that, what you claim are chemtrails are trails of condensed water from the cooling exhaust air. Kindly gtfo with your nonsense.